Find your filter pads and loose filter media for Aqua One's new Ocellaris 400 External Canister Filters, along with those essential Aqua One Spares such as tap sets and impellers. We have huge stocks for all Ocellaris filters, ready for immediate despatch. 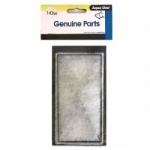 Genuine Aqua One Black Sponge Pad for use with Ocellaris 400 Canister Filters. The 143s Black Sponge traps large particles of aquarium debris and provides a home for beneficial bacteria. Genuine Aqua One White Wool Pad for use with Ocellaris 400 Canister Filters. The 143w Polymer Wool Pad traps and removes fine particles of aquarium debris. Change every 4 weeks. Advance Carb 250g Premium Activated Carbon will perform several important functions in your Aqua One set up. As well as removing tannin from the water - resulting in crystal clarity, it will remove many other toxins and pollutants leaving water pure. Genuine Aqua One pump impeller set for use with Ocellaris 400 Canister Filters. The impeller comes complete with shaft and end caps and is a direct replacement, identical to the impeller that came with your setup when new. Genuine Aqua One Ocellaris 400 Canister Filter, supplied complete with all necessary filter media and pads, featuring quick release taps and one touch primer and virtual silent running. Suitable for aquariums between 60 to 100 litres. Original Aqua One Intake Stainer to suit all Ocellaris Canister Filters. Simple, convenient push-fit.